From left, Patty and Helen don’t feel the burn. LA VERNE, California, October 30, 2017 — How many times have you dropped a microwaved cup of coffee or casserole faster than a hot potato after realizing your hands and fingers felt like they were on fire? To protect themselves — and us — from all those steaming and scalding vessels of food and drink whose molecules get over-agitated from the bombardment of too many high-intensity radio waves, Patty Yoder and her mom Helen of La Verne created microwavable bowl-shaped pot holders. While pot holders have probably been around as long as the first caveman or cavewoman, Patty’s and Helen’s pot or cup holders have rounded corners that keep them from flopping into the soup or other leftovers you’re zapping in the microwave. That was their ah-ha moment! Curves, not squares. Made from 100% natural microwavable cotton batting, their holders come in a variety of seasonal designs and are well insulated. “My husband likes to use his for his ice cream dish because the ice cream doesn’t melt as fast,” she said, explaining the multiple uses and applications she has found for her pot holders. Placing them under serving dishes will also keep your food hotter for longer, Patty claimed. Each microwavable pot holder is hand-made, requiring about an hour to complete. When in production, Patty and her mom place two tables face to face and pass the pot holders back and forth until their work is done. That’s the extent of their assembly line when a big order comes in. “This way, we get plenty of mother-daughter time,” Helen said. 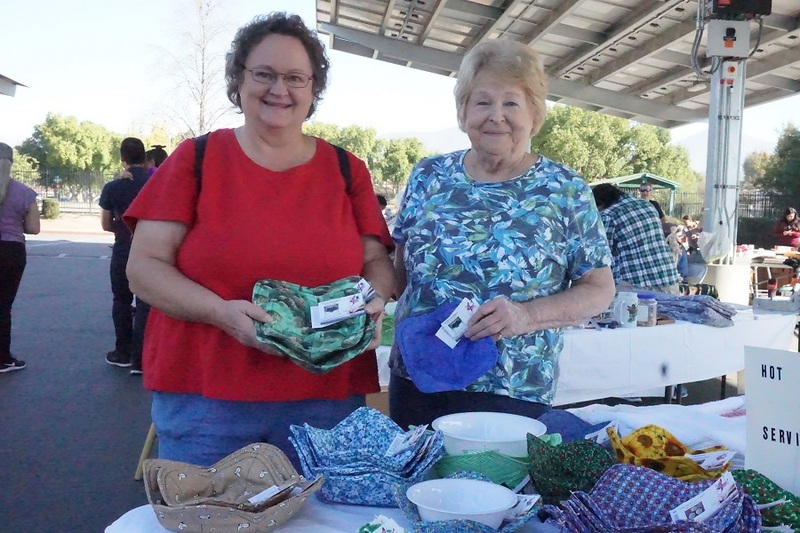 Patty learned the art of sewing at a young age, and has branched out to make not only microwavable pot holders, but also custom towels, place mats, mug holders, quilts and special-order costumes. “Disney needs to hire you,” said a customer impressed with the quality and prices of their products being showcased at the Community Yard Sale held at Bonita High School on Saturday. To contact “Practical Patty,” call her at 951.533.6088 or email her at pattyyoder13@hotmail.com. For all your real estate needs, Call Coll, at 909.374.4744. Colleen is a longtime La Verne Realtor, with Sotheby’s International Realty.